The Catechism of the Catholic Church states that sacramentals such as the Brown Scapular "do not confer the grace of the Holy Spirit in the way that the sacraments do, but by the Church's prayer, they prepare us to receive grace and dispose us to cooperate with it." The scapular must consist of two pieces of brown cloth with one segment hanging on the wearer's chest, and the other hanging on his/her back. These pieces are joined by two straps or strings which overlap each shoulder—hence the word "scapular" (shoulder blade). Images sewn onto the Brown Scapular are unnecessary. In the past the scapular was required to be 100% wool but this is no longer required. Old Testament History Mount Carmel is on the northwestern coast of Palestine. The Hebrew word for Carmel means 'Beautiful Garden Land'. The Origin of Carmel goes back to about 860 B.C. to the time of the prophet Elijah and his victory over the pagan prophets and their god, Baal. The account of this event is given in 1 Kings 18:19-40. Elijah stood firm and challenged the prophets of Baal to gather on Mount Carmel to determine which God, Baal or the Lord was the true God. Later a community of prophets joined him. They dwelt in caves, praying to God, living in peace. Before coming into Europe, the Carmelites were hermits living on Mount Carmel in Palestine. St. Simon Stock, became the Vicar General of the Carmelite Order. Origianlly, the Scapular was two pieces of cloth joined at the shoulders and hanging down the back and breast had deep spiritual meaning. Our Lord said in the gospels, 'My yoke is sweet and my burden is light.' The monks by putting on this garment realized that the sweet burden of Divine service was upon him and the whole day was dedicated to God. Faith and actual living were one in the middle ages. The monk presented himself to God, His Divine Master.' 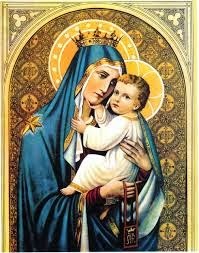 Our Lady appears to St Simon Stock while praying, giving him the Brown Scapular and making this promise: "Take this Scapular, it shall be a sign of salvation, a protection in danger and a pledge of peace. 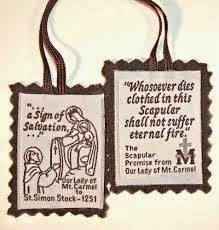 Whosoever dies wearing this scapular shall not suffer eternal fire." There are those today who say this apparition doesn't have the documentation to prove its validity. After Our Lady appeared to Saint Simon, almost immediately a miraculous change took place in the Order. In the beginning only the Carmelites wore the scapular. But by the 14th century the privilege of wearing the scapular extended outside the order. Lay groups and third orders were formed. Some of these groups were called confraternities. Still Our Lady continued to favor the Carmelite Order and her scapular with further blessings and promises. In 1321, St. Peter Thomas was told by Our Heavenly Mother that 'the Order of Carmel is destined to exist until the end of the world'. Any Catholic priest may invest a baptised Catholic with the Brown Scapular. Lay people are unable to bless a Scapular. The most recent Rite for the Blessing of and Enrollment in the Scapular, approved in 1996 by the Congregation for Divine Worship and the Discipline of the Sacraments, is available in booklet form, the "Catechesis and Ritual for the Scapular of Our Lady of Mount Carmel". Receive this Scapular, a sign of your special relationship with Mary, the Mother of Jesus, whom you pledge to imitate. May it be a reminder to you of your dignity as a Christian, in serving others and imitating Mary. Wear it as a sign of her protection and of belonging to the Family of Carmel, voluntarily doing the will of God and devoting yourself to building a world true to his plan of community, justice and peace. According to a 1996 doctrinal statement approved by the Congregation for Divine Worship and the Discipline of the Sacraments, "Devotion to Our Lady of Mount Carmel is bound to the history and spiritual values of the Order of the Brothers of the Blessed Virgin Mary of Mount Carmel and is expressed through the scapular. Thus, whoever receives the scapular becomes a member of the order and pledges him/herself to live according to its spirituality in accordance with the characteristics of his/her state in life." Faithful Anglicans who wish to wear the Brown Scapular are likewise invested by an Anglican priest.